I would like to tell you about an idea that started in January 2017. While attending the “Walk for Alzheimer’s” in Niagara, I noticed a family wearing a shirt with a picture and name of a deceased family member. It was very moving to see the entire family come together, wearing the same shirt to remember a loved one. A month after the walk, Brother Bob White passed away. Brother White’s passing impacted an entire generation of activists across Canada. Everyone who knew Bob White had great respect for him and many wanted to pay tribute to this great leader and activist. Bob White was a true hero to so many, which brings me to the campaign. 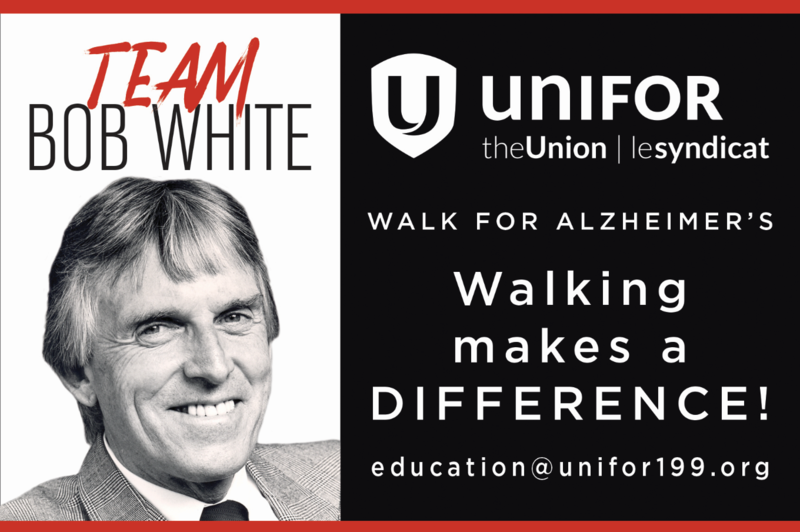 We formed Team Bob White and started to enter teams across the province, Unifor members and their families participated in the“Walk for Alzheimer’s”, many wearing “TEAM Bob White” T shirts. We raised funds with pledges, donations and workplace collections for a good cause and payed tribute to Brother Bob White. The Alzheimers Society just informed me that collectively walks held in (Durham, Niagara, Woodstock Windsor, Hamilton, London & Tilsonburg) raised over $50,000 in 2018. The Alzheimer Society’s “Walk for Alzheimer’s” draws attention to dementia. What most Canadians don’t know is that 564,000 Canadians are currently living with dementia in Canada. This statistic is projected to grow to a staggering 937,000 in 15 years. Over 1.1 million Canadians, including our members are directly or indirectly impacted by this disease. The cost to provide care is $10.4 billion per year. No matter who you talk to, there is always a connection to this disease, it affects everyone! The Alzheimer Society’s “Walk for Alzheimer’s” is a national campaign. Entering teams provides media attention for both the Alzheimer Society, Bob White and what he stood for a fair, a just and compassionate Canada. More importantly, we can offer hope and assistance to families through a difficult and challenging time. Locally, we helped raise thousands of dollars every year in Niagara. 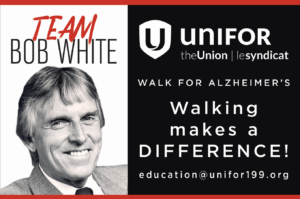 This year we are building a team for the next “Walk for Alzheimer’s” Sunday January 27th at Brock University and plan to significantly increase the number of walkers and the amount of funds raised as a tribute to Brother Bob White. We thought other Unifor members would like to get involved. Ask your Local Union to order t-Shirts for your team. The discounted price per shirt is only $15, plus delivery. We are also interested in hearing your stories, how dementia or Alzheimer’s has impacted your family and what needs to be done. We thank you in advance for your participation in this campaign. We hope you will consider making a donation or walking in the next event as an individual or as part of a team. Please contact me if you have any questions about this campaign. Together we can help to improve the support for families impacted by dementia. Special thanks to Jerry Dias, President of Unifor, Bob Orr, Treasurer Unifor, the White Family and Alzheimer’s Society for their encouragement and endorsement of this campaign.